Lack of storage space is a big issue with different windows users. The duplicate files plays an important role to cluttered up storage space of your Laptop or Computer. You can easily find and delete duplicates in Windows 10 Operating System using CCleaner. During finding the duplicate files on your system could easily result in clean out similarly sizable and large files are found. You can delete these duplicate large size files from your system to get free space on your disk or drives. 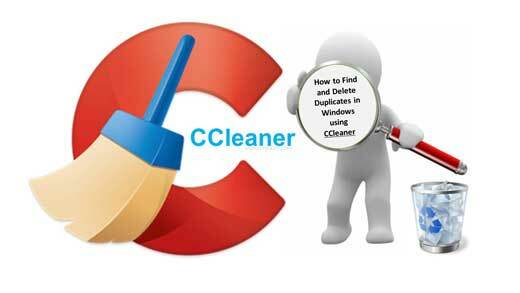 CCleaner helps you to find and remove duplicate files in Windows 10 O.S. If you have old windows backup file, then you can also remove that backup file to the free the storage space, if it is not useful. Due to cluttered up quantity of duplicate files there are lot of issue’ arise. Your free storage space reduces, PC run slower, face different type of difficulty and many more. In that situation you need to find and delete these duplicate files and format your system. Unfortunately, Windows itself doesn’t make it easy to deal with duplicate files for finding and deleting them. There are two choices either using any third party app or find and delete duplicate files in windows 10 manually. It’s not easy and time consuming task to do this job manually. So, mostly windows users like to use any third party app to find and remove duplicate files in Windows 10 Operating System. In this guide we have to discuss a free to use program which is per-installed on different PC’s, with the name of CCleaner. CCleaner allows you to perform advanced search and delete files to free your drive of unwanted clutter. You can use free to use version to install this application at your device to clean these files. There are different apps which helps you to quickly find and delete duplicates in Windows 10 O.S. CCleaner is an utility program which helps you to clean potentially unwanted files, corrupt registry files from your Window O.S. All unwanted files like temporary internet files, malicious programs, code, duplicate files and many more files located by this application. If you relay want to find and delete duplicate files in Window 10 O.S. using CCleaner. To do this job, you have to take following given steps. Step 1: Open your CCleaner application at your Desktop PC or Laptop. Step 2: Click on the Tools option > Choose Duplicate Finder > Turn on required options before starting searching process for duplicate files. Click on the Search button to start finding process of duplicate files in Windows 10. Step 3: After finish the searching process you will get a list of duplicate file. Select one by one all duplicate files which you want to delete them from your system. Now, click on the Delete Selected button which is located at bottom right corner of active CCleaner window. I’ve been using Winodws 8.1 on my Lenovo laptop, but before few days i got notifications to upgrade your operating system with Windows 10 without any cost. After that i have start the up-gradation process of operating system on my laptop. After complete the installation process, i faced touchpad problem. Most of the person also facing this type of problem. Did you also having touchpad issue in Windows 10? If yes then read this guide to know how to fix them.